In this episode of Seattle Real Estate Chat, Jim Reppond and I compare renting in Seattle to buying a home. With rents on the rise and mortgage rates at very low levels, it may be worth considering making the move to buy a home. Here’s our Google Hangout where we discuss Seattle’s current rental market. Mortgage rates are actually currently lower than what we have quoted in this video which was recorded just over a week ago. Seattle Curbed recently shared what $1500 a month rent provides you in Seattle right now. 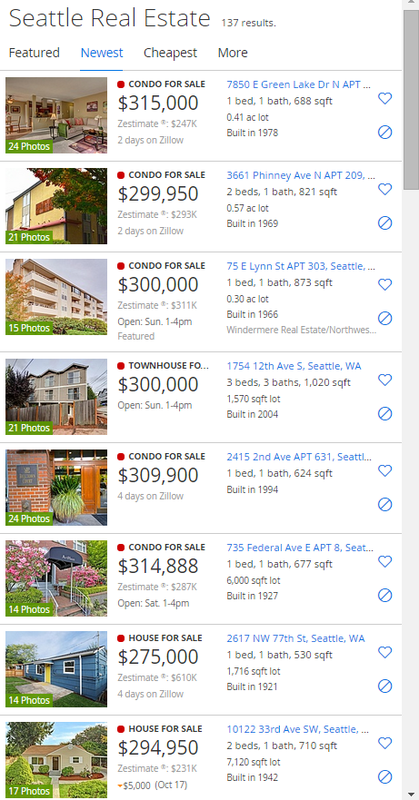 A quick search on Zillow shows around 140 detached homes and condos in Seattle available in the $275,000 – $320,000 price range. Because our video chats have limited time, I only used a simple minimum down conventional mortgage. I have many mortgage programs available from those with down payment assistance to reduced down payment for jumbo mortgages. If you’ve been thinking about buying a home, a good first step is getting prequalified. Getting prequalified simply means that you’re verbally reviewing your income and assets with a mortgage professional. At this step, you don’t have to have your credit ran or provide documentation. There should be no cost for getting prequalifed and the mortgage professional should be happy to provide written rate quotes illustrating potential scenarios for you. This will also help with showing how much the down payment and funds for closing will be needed for a certain home or price range and what the mortgage payment looks like. The next step after that is getting preapproved, which means you’re providing income and asset documents and having your credit pulled and reviewed (for starters). I’m happy to help you with your home purchase or refinance for homes located anywhere in Washington state. Even if buying a home is a year or so away, you can’t start too early with gathering information and developing a game plan. If I can help you, please contact me!